The EU has been built through a series of binding treaties. Over the years, EU member states have sought to harmonize laws and adopt common policies on an increasing number of economic, social, and political issues. EU member states share a customs union; a single market in which capital, goods, services, and people move freely; a common trade policy; and a common agricultural policy. Nineteen EU member states use a common currency (the euro), and 22 member states participate in the Schengen area of free movement in which internal border controls have been eliminated. In addition, the EU has been developing a Common Foreign and Security Policy (CFSP), which includes a Common Security and Defense Policy (CSDP), and pursuing cooperation in the area of Justice and Home Affairs (JHA) to forge common internal security measures. Member states work together through several EU institutions to set policy and to promote their collective interests. In recent years, however, the EU has faced a number of internal and external crises. Most notably, in a June 2016 public referendum, voters in the United Kingdom (UK) backed leaving the EU. The looming British exit from the EU (dubbed “Brexit”) comes amid multiple other challenges, including the rise of populist and to some extent anti-EU political parties, concerns about democratic backsliding in some member states (including Poland and Hungary), an influx of refugees and migrants, a heightened terrorism threat, and a resurgent Russia. The United States has supported the European integration project since its inception in the 1950s as a means to prevent another catastrophic conflict on the European continent and foster democratic allies and strong trading partners. Today, the United States and the EU have a dynamic political partnership and share a huge trade and investment relationship. Despite periodic tensions in U.S.-EU relations over the years, U.S. and EU policymakers alike have viewed the partnership as serving both sides’ overall strategic and economic interests. EU leaders are anxious about the Trump Administration’s commitment to the EU project, the transatlantic partnership, and free trade—especially amid the Administration’s imposition of tariffs on EU steel and aluminum products since June 2018. In mid-July 2018, President Trump reportedly called the EU a “foe” on trade but subsequently reached an initial agreement with the EU later in the month aimed at de-escalating U.S.-EU tensions over trade and tariffs. Concerns also linger in Brussels about the implications of the Trump Administration’s “America First” foreign policy and its positions on a range of international issues, including Russia, Iran, the Israeli-Palestinian conflict, climate change, and the role of multilateral institutions. This report serves as a primer on the EU. Despite the UK’s vote to leave the EU, the UK remains a full member of the bloc until it completes withdrawal negotiations and officially exits the EU (expected to occur in March 2019). As such, this report largely addresses the EU and its institutions as they currently exist. 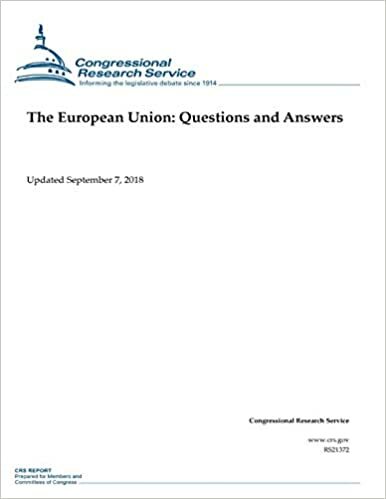 It also briefly describes U.S.-EU political and economic relations that may be of interest in the 115th Congress.